Note: Reliance Jio is a 4G broadband service recently launched in India. Mukesh Ambani’s launch of Jio 4G cellular service is barely out of beta testing and the naysayers are already out in hordes. All because the launch ad dedicated the service to Digital India and featured a photograph of the Indian Prime Minister, Mr. Narendra Modi. 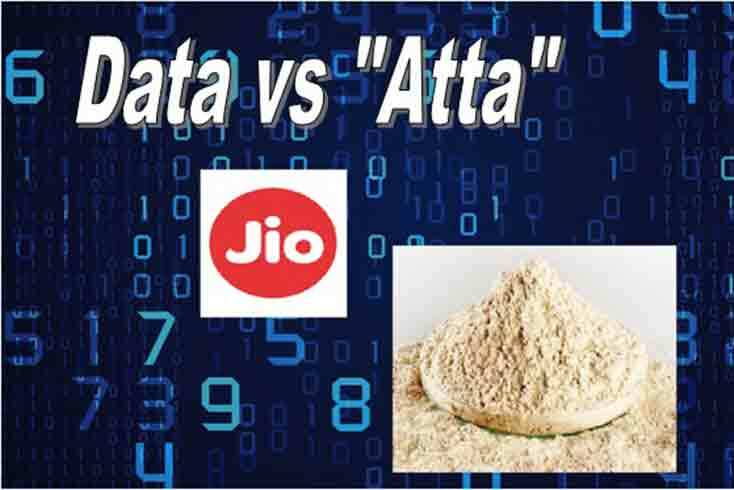 Shri Laloo Prasad Yadav, in his inimitable style, came up with a nursery rhyme in Hindi lamenting about the price of “atta” (flour) being more expensive than cellular data – “Gareeb data khaeyga, ya atta” (What will poor eat – atta or data?). The champion of Aam Aadmi Party, Mr. Arvind Kejriwal, accused the prime minister of “modeling” in Reliance ads and ignoring the downtrodden. Congress party is apparently demanding a probe into whether Reliance obtained appropriate permission to use Mr. Modi’s photograph. Unfortunately they are all missing the point. Let us assume that the naysayers mean well and are really concerned about improving the economy and not political maneuvering. So the best case scenario is that their attempts to attack the government and implicitly attack Reliance on this front are misguided. “Atta” and data are not mutually exclusive. Knowledge based economies, smart industries and automation will rule the next few decades. Price of “atta” notwithstanding, without a high speed cellular/data network, India is getting nowhere on the world stage. Perhaps the naysayers have been too busy crafting catchy slogans while attacking Mr. Modi and Reliance that they missed the transformation brought about by the mobile revolution in India. While there is a long way to go, the benefits are already there and cannot be debated. From the rickshawala in a small town who gets a text on his phone to pick up kids from school to the launch of world class companies like Ola and Flipkart, mobile revolution has already started the transformation in India. Granted, there are several other issues that India need to address – access to clean water and power to name two. This however does not negate the fact that services like Reliance Jio will be absolutely crucial to India’s transformation from an economy where 49% of the workforce is engaged in agricultural production to a more balanced split between agriculture, industry and services. Mukesh Ambani “gets it” – digital transformation is key to India’s future. Will Reliance Jio be as disruptive as Mr. Ambani claims? As they say in automotive testing, the road will tell. Reliance is a company that can execute. Yes, calls will be dropped, service will fail at times and coverage may be spotty to start with. These are teething challenges and to be expected. The very fact that it has shaken the other incumbents to scramble is disruptive in itself. Also read – Project Digital India – Hype or Reality? Let us up the ante and challenge Reliance and Mr. Mukesh Ambani to do more – blanket India with the highest speed data network possible by Jan 1st 2020. In other words, Go Big or Go Home. Keep it low cost for most subscribers and offer zero cost to villages. Work with the government to craft a viable long term sustainable strategy. This is an area where big government and big industry need to work together. Government paves the way by reducing red tape, the industry executes. Now imagine the possibilities of a digitally connected India via services like Reliance Jio. A kid in a remote rural location in Orissa having access to the same high quality education as a kid in Pali Hill, delivered via high definition video. Girls in U.P. no longer having to travel 4 hours everyday to get education because of real-time live streaming of lessons delivered where they are. Real-time information aggregation and dissemination on disease outbreaks. People know what to do and where to go for treatment on their favorite Jio phone. Doctors in a rural hospital in Motihari, Bihar connecting with their peers in AIIMS, New Delhi via HD video links to discuss treatment options. Then getting life saving medicines delivered via solar powered drones and real-time tracking on a Jio network phone. Kudos to Mr. Ambani and Reliance for the launch of Jio. Ignore the naysayers. Execute the plan. And if success depends on using Mr. Modi’s photograph then I am sure he wouldn’t mind. Mr Laloo Prasad Yadav will surely have more punchlines coming to make us laugh. But you can be sure that once India’s digital transformation picks up steam, the price of “atta” will be the last thing people will worry about. PS: I remember trying to book a train ticket on Rajdhani from Mumbai to Delhi in 1993. All seats on all long distance trains for several months were already booked by local gangsters. I had to pay INR500 extra to a tout named “Shanu” to get a seat through RAC (“Reservation Against Cancellation”, where a tout would cancel one of his bulk reservations and hence you got a seat). Sorry Shanu, I don’t need your services anymore – I will use Reliance Jio to book my travel next time I am in India. Previous articleHow 9 Girls Who Attended a Thimphu Pool Party, Fall Pregnant? I have always been fascinated by technology and its impact on socioeconomic issues. For me, discussing technology on its own without understanding the societal impact is meaningless. My latest obsessions are Digital transformation, Artificial Intelligence and Social Networks. On the "other side", my love for photography coupled with a passion for hiking means I get to explore interesting landscapes, especially in North America.